We invite you to explore India - the Land with infinite beauty ! Whether you soar high into Himalayas or peer under the ruins of the Ancient monuments dotting the landscape of India, you will cherish the experience long after your visit ! This India Travel Guide on Ranganatha Swami Temple is free from any commercial interest! This site is dedicated to promote India - the vast subcontinent, its glorious past, magnificent landscape and its infinite variety. Sri RanganathaSwami Temple in Srirangam in Tamil Nadu is the largest functioning Hindu Temple in the World. It covers over 6 million square feet of land, almost on the bank of the River Cauvery. It is named after the Hindu Vaishnavaite God - Vishnu and it traces its origin to some 2000 years in the past. The Chola dynasty who began the construction of this temple , modelled the temple in the typical South Indian Temple Architecture - with several multi-tiered tall Gopurams. Blessed and sacred is river Cauvery! The Dakshina Ganga or Ganges of Tamilnadu has on its banks many ancient temples. Referred as 'Booloka Vaikuntam', Sri Ranganathaswami Temple, Srirangam, Trichy is just 0.6 km from the River Cauvery. There are eight svayam-vyaka kshetras or abodes of the self-manifested forms of Lord Vishnu. The glory of these abodes is mentioned in the Puranas. 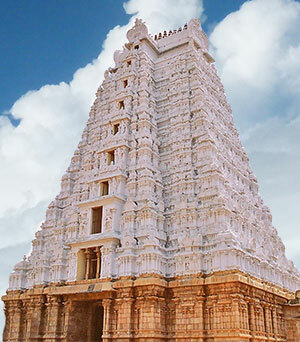 Srirangam, Sri Ranganatha Swami temple is the foremost of the eight temples. The focus of the temple is indeed the presiding deity Sri Ranganatha Swami and every devotee's spiritual endeavor is to seek His blessing. The glory of the temple is exemplified by sages, saints and great kings of various dynasties and different eras. In Sri Ranganatha Swami Temple, Srirangam a galaxy of sages and saints worshipped the Lord and deepened their spiritual knowledge. To think of those moments, the sense of walking on the corridors where saints and sages endowed with spiritual vision have walked past thousands of years back draw forth upon oneself a shower of purity, inspiration and divine consciousness. Also, great kings of various dynasties have contributed immensely to their favorite Lord. Cholas, Pandyas, Hoysalas, Vijaya Nagaras and Nayaks - rulers of different eras regarded the temple as a fulcrum to uphold cultural tradition. The architectural splendor of Sri Ranganatha Swami Temple illustrates significant stages in human history and is a reminder of the rich cultural past of the temple. The temple has been constructed in the Dravidian style architecture. Though the physical structure has undergone modifications, it has retained an eminent position being the largest functioning Hindu temple in the world as it covers an area of 6,790,000 sq feet with a perimeter of 10,710 feet. The inscriptions, highest in number amongst temples in South India illustrate the political, cultural, economic and social history of the bygone eras. Efforts are on to include the temple in UNESCO's list of Heritage site as 6 out of 10 criteria are fulfilled for declaration as a world heritage site. Sri Ranganatha Swami Temple, Srirangam is the foremost of 108 divya desams, 105 vaishana temples in India, majority of temples in South India, 1 in Nepal and 2 in celestial world, the parama padam and thiruparkadal. The word divya+desam when split literally means 'premium+place'. Divya desam is a Vaishnavaite shrine wherein at least one Alwar (Azhvar) has visited singing hymns praising the presiding deity. Alwars were regarded as an amsam (Sankrit word amsam means fraction/portion) of Sriman Narayana (Maha Vishnu). Exact historical period of the 12 Alwars is still debated. Spread over centuries, approximately 7th to 9th century, Alwars manifested in South India with a purpose - the divine duty of spreading the bakthi of Sriman Narayana (Vishnu). Alwars sang songs at various sacred Vaishnava shrines including Sri Ranganatha Swami Temple, Srirangam. Their hymns 'Divya prabandham' are 4000 poems that extol the beauty, courage and wisdom of Lord Vishnu in various incarnations as the savior of the world. Uniquely the pasurams bear resemblance to the Vedas, Upanishads and Bhagavad Gita. The language though differs. The 4000 pasurams are in Tamil. Sri Ranganatha Swami Temple Srirangam is the foremost of the 108 Divya Desam. Of the 12 Alwars, eleven Alwars with the exception of Madhurakavi Alwar have sung the glory of the presiding deity, Sri Ranganatha Swami. The temple is also considered as a Navagraha sthala (nine planets) dedicated to Sukran (planet Venus). Also, the temple is the greatest center of the Vaishnava religion (Thalaimai Peetam) and the most visited Vaishnava pilgrimage center in India. Such is the greatness of the temple that visiting Sri Ranganatha Swami Temple, Srirangam, Trichy is equivalent to visiting all the Divya Desams. The sannadhi of Moolavar, from the entrance to the sanctum, the interiors are carved in silver metal. Combined with the aroma of flowers, incense sticks, recital of stotras, the thirtham with thulasi leaves, one is transported to a unique spiritual sphere. The Moolavar (presiding deity) is Sri Ranganatha Swami enshrined in a reclining posture (anantha sayanam) on Adisesha (adi - first, sesha - king of snakes (the foremost of snakes)) with feet on lotus flower presumably floating in the sea of milk. The idol is svayamvykta, i.e. created by God, the God Himself choosing to come down to earth in the form of an idol. The moolavar, Sri Ranganathar is rooted and cannot be moved. All rites (poojas) are performed to the moolavar. Other names for Sri Ranganathar are Nam Perumal (Our Lord), Periya Perumal (Great Lord), Azagiya Manavalan (beautiful groom) - ardent attributes reveling in Lord Ranganatha. There are many slokas (divine texts); hymns that spiritually inclined devotees recite in the presence of Sri Ranganathar. Ranganatha Ashtakam by Adi Shankaracharya: This was composed by Adi Sankara Bhagavatpada when he stood before Sri Ranganatha in Srirangam. Singing in praise of Lord Ranganatha in the first 7 slokas and the 8th sloka confirms Srirangam as the place that assures Nirvana to a soul that leaves the mortal body. Sri Vishnusahasranamam : Vishnu Sahasranamam is a Vedic chant of the 1000 names of Vishnu, written by Shri Veda Vyasa, praising Sri Mahavishnu as taught by Sri Bheeshma in Mahabarata. According to Bheeshma, chanting the Vishnu sahasranama or even listening to the 1000 names of MahaVishnu removes sins and obstacles. There are many other stotras as well. Sarva Vignobha Sandhaye To Remove all the Obstacles on my path. It is widely believed by the Hindus that chanting VishnuSahasranamam bestows peace of mind, prosperity, perpetual reputation and he/she will be free from any disease. The utsavar in Srirangam Temple is in Ninra Thirukolam (standing posture). During festivities, the Utsavar in Ninra Thirukolam (standing posture) bestow divine grace. The consort, Sri Ranganayaki Ammaiyar is also known as Sri Ranga Nachiyar. The shrine of Thayyar is in the fourth prakaram. The temple complex comprises about 53 upa sannathis (other shrines). Prominent amongst them are Thayar Sannathi, Chakkarathazwar sannathi, Sri Udayavar (Ramanujar) Sannithi, Gardalwar Sannathi, Danvanthri Sannathi, Hayagrevar Sannathi. There are shrines for Sri Rama, Sri Krishna, Lord Hanuman and Andal. Legendary stories unravel at every point of the temple. Kambar Ramayana recitation: When nearing the Azakiya Mettu Singar Sannidhi, devotees may recall an event that took place. When Kambar, (medieval poet and author of Kamba Ramayana) wanted to recite his literary work in this Sannidhi, the Acharyas (spiritual preceptor) objected. The debate to recite or not was finally left to God's will. In response, those who had gathered there including the Acharyas and the poet heard a voice (Asareeri in tamil) from the 5th prakaram i.e. Azakiya Mettu Singar Sannidhi confirming the acceptance of poet's work. Kambar did recite Kamba Ramayanam and the place is named as Kambar Mandapam. Sthala puranam: Lord Brahma was blessed with a gift by Lord Vishnu as an appreciation for his sincere penance.It was the idol of Sri Ranganathar. The same was gifted to Ikshvaaku, the forefather of Raghy Dynasty by Lord Brahma himself. In due course, the idol was passed on to his descendants and soon in the hands of King Dasaratha and then to his son Sri Rama (an avatar of Lord Vishnu). After the war between Sri Rama and Ravana ended, Vibhishana (brother of Ravana) attended Sri Rama's coronation as the King of Ayodhya. It was Sri Rama's turn to gift Vibheeshana. The idol was gifted by Sri Rama to Vibhishana but with a condition, that if the idol touched the ground, it cannot be moved further and would remain in the same place. Vibhishana agreed and vowed to carry the idol on his head till Sri Lanka, his destination. Vibishana started his journey towards Sri Lanka. He had reached Srirangam. It was the time of evening to perform Sandhya Vandanam. Vibhishana wanted to perform Sandhya Vandanam. Vibhishana remembered Sri Rama's word and was wondering how to perform Sandhya Vandanam as he was carrying the idol. Soon, Lord Ganesha appeared as a cowherd boy. Vibhishana requested the boy to hold the idol until he performed Sandhya Vandanam. The boy agreed but with a condition. In case he is unable to handle the weight he will call for Vibhishana three times. In the absence of a response, he would place the idol at the very place i.e. on the banks of River Cauvery. As destined, the three calls of the cowherd boy weren't heard by Vibhishana. After performing Sandhya Vandanam, Vibhishana returned to take the idol from the cowherd boy. By then, the idol was kept on the ground. Attempts by Vibhishana to lift the idol from the ground go in vain. Angry with the boy's act, Vibishana wanted to punish the boy with a blow. Attempting to escape from the angry Vibishana, the cowherd boy ran towards a small hillock (Trichy, Ucchipillaiyar Koil). The boy in disguise regained his own form - Lord Ganesha. Vibhishana continued the chase and hit on the head of Ganesha. Even now a light bump on Lord Ganesha's idol signifying the blow can be seen. Soon, Sri Ranganathar appeared before Vibishana and explained that it was His wish that the idol remain in the destined place till the end of Kali Yuga and then return back to Satya Loka. He consoled Vibishana saying that though stationed in bharatha kandam, he would be facing Sri Lanka. Devotees may notice the presiding deity facing the South direction at the Moola Sthanam. Gracing Thiru mangai Alwar: Thirumangai Alwar has sung 1200 hymns out of the 4000 hymns, nallaera divya prabandham. All the seven praharams (big walls) were built by the Alwar alone. Please with his bhakti, Sri Ranganathar graced him with His darshan. Samadhi of Ramanujar: Regarded as the incarnation of Lakshmana, the younger brother of Sri Rama, Ramanujar preached the Visishta Advaita philosophy. The three doctrines of Vedanta, Dvaita, Advaita and Vishishta Advaita's common goal is one and the same - realizing God. Ramanujar lived 120 years and half of his life time, he lived in Srirangam Temple. The title Udayavar, meaning owner of two worlds was conferred by Nam Perumal. There is an anecdote relating to this title. Captivated by the darshan of Sri Ranganathar, Ramanujar stayed back at Srirangam Temple. In due course, he was declared as the head of the temple administration and also the leader of Vaishnavites. A manual called Koil Ozuku that sets out codification of rituals in the temple to be conducted is mentioned. Even after thousand years, the same is being adhered to. His devotion to duty earned him the title Udayavar. Many other titles have been anointed on Ramanujar. His literary works are aplenty. When Ramanujar attained Acharyan Thiruvadi (lotus feet of the Lord) (leaving his mortal body) his remains were interred inside the temple. There is a wax-look alike in his sanctum statue which is consecrated with chandan and saffron twice in a year. For an ardent devotee, spending a full day at the temple would not suffice. All round the year festivals are celebrated. The 1000 pillar mantapam, (actually 953 pillars) the grand architectural treasure of the temple need an elaborate touring to appreciate its beauty and splendor. A visit to the museum that houses exquisitely carved sculptures, rare copper plates, ivory sculptures, swords, paintings and images of kings, rare palm leaf manuscripts etc cannot be missed out. There are 21 gopurams, the largest gopuram in the first wall on the southern side of the temple is 13 tiered, measuring 73 meters. Stepping out the temple, devotees can visit the houses of Alwars who lived in Srirangam. Complete the visit with the prasadams such as chakara pongal (sweet pongal), Puliyodarai and thayir sadam (rice with curd).